Mesh size is one of the most common problems in FEA. There is a fine line here: bigger elements give bad results, but smaller elements make computing so long you don’t get the results at all. You never really know where exactly is your mesh size on this scale. Learn how to choose the correct size of mesh and estimate at which mesh size accuracy of the solution is acceptable. As an example, I will use a simple discretely supported shell. As an “outcome” I will use the critical load multiplier of the first eigenvalue. You can see the model I used below. Notice how deformation shape and outcomes changes with the mesh refinement. I should write that mesh refinement check (often called mesh convergence) should be made for each problem. This is somewhat true but let’s face it, you won’t make it for each problem most likely… it simply takes a lot of time! I would suggest you do such a study for some of the most important projects/parts and based on that experience you can extrapolate the knowledge to similar problems. In this example, I am using QUAD4 elements (normal 4 node quadrilateral elements, sometimes referred to as “S4”). For our shell, I have performed some analysis for different element sizes. On the drawing above you can see the outcome for few selected meshes. Please notice, that for biggest elements actual eigenvalue shape is different than in the case of models with more refined mesh. Usually smaller mesh means more accurate results, but the computing time gets significant as well. You should search for balance between computing time and accuracy. In some instances you can increase computing time over 2 times to improve accuracy by 1% – for me, that seems unreasonable. Knowing your problem you will know best what makes sense and what doesn’t, based on what accuracy do you need. When mesh density is being discussed in tutorials, different problems are solved with known analytical solution. 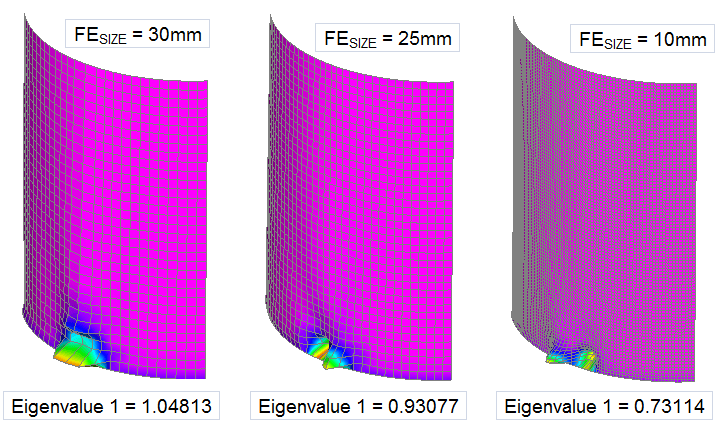 You can then easily compare the FEA outcome to a known solution – you get an error value without trouble. This is a fantastic approach that can teach you a lot, but unfortunately in reality you don’t know the correct answer… so you can’t really do that can you? Reduction of finite element size leads to more elements, which in turn leads to more nodes in the model. If we build a chart showing the outcome (in this case first eigenvalue) dependence on node count in the model, this chart will be asymptotically reaching for the correct answer (in this case 0.6947). 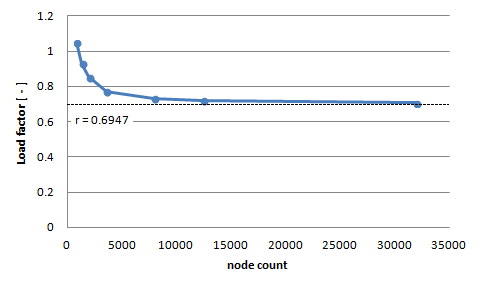 Node count is only one of the parameters possible here. Since I simply decreased the element size in the entire model it made sense. You can just as easily use a number of elements on the width of your part, or size of the “typical” element. If you refine mesh only in a small area (i.e. where the stress concentration is) you can easily use a node count in that area instead of entire model etc. Exact estimation of asymptotic value on the chart above may be problematic or time-consuming. 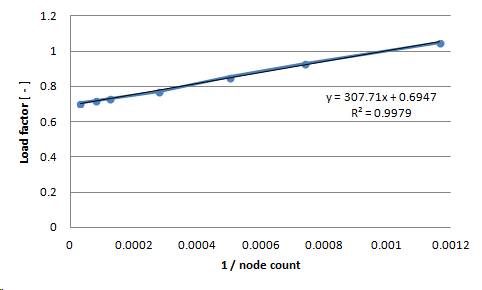 There is a simple trick to make things easier to calculate: instead of node count on horizontal axis let us use 1 / node count. This way the correct answer will be where horizontal axis value reaches 0. This means that if we approximate our curve with the equation (in most cases linear approximation is sufficient, Excel does this automatically) it is very easy to calculate “y” value for x = 0. Now you know how accurate results you will get with given mesh, and how much time computing will take with such approach. Making a decision is always problematic. I usually think about how sure I am about loads or boundary conditions – usually, those are just “estimated” and then increased “just to be sure”. When that is a case a mistake of few percent won’t do any harm. Time is also a factor to consider here. If you have 100 similar models to calculate increasing computing time 2 times will take A LOT of time… just something to consider. Notice that this chart is asymptomatically reaching to 0%… if you have made all the steps, described here, and your chart does not go toward 0 chances are you used too big elements. Just know that if you are not sure it is wise to make one model with “extremely” small elements – you know… just in case. When you first do mesh convergence you will realize, that to have a great accuracy computing time will be significant. That is true, but you are not defenseless. Look at the similar shell below. Coarse mesh gives bad results for sure, but the very fine mesh takes a lot of time to compute. Knowing that the stability failure occurs at the bottom I have made a third model (on the right) that has very fine mesh where it is important, and coarse mesh where “nothing happens”. This is one of the topics I teach on my: free FEA essentials course. Subscribe below to get it! hi, it is bit difficult to understand of ” make it bit easier “. i didn’t understand what you written so please say easier to me sir . I’m not sure how to help you – could you perhaps ask a specific question? Can you please explain about Critical Load Multiplier and why are we using it here? I am unfamiliar with it! Thanks. Thank you for the kind words! I’m really glad that you like it! How can we do accurate mashing? What should be the steps for this? Can you provide me the best tutorial for ansys software? Especially the lantern example has around 1h of meshing tutorial inside. But… everything is done in Femap, and I have no experience in Ansys so I won’t be able to help you with “clicking” – only the “how to and why” will be useful to you (luckily I believe this is the most important thing, so I had the audacity to propose the examples). my name Alex. Actually, I´m doing some examples to obtain a mesh size and estimate the error related to this mesh size. This is awesome…On your example, you calculate the same model with different mesh size on Linear Buckling Analysis…Whats the strategy for other analysis… in the model with singularities I don’t have a correct result(the infinite maybe)…How manage this issue? Nonlinear approach? I’m really glad that you find this useful! All the best mate and good luck! Hi Lukasz, thanks for the explanation. I find it useful. However, I would like to know how the error “values” were obtained in order to plot the curve/chart. Thank you. Thanks for the question! I extrapolated the line for the answer I’m willing to call the correct one (0.6947). Knowing the “correct” answer, and the answer for a given mesh I could calculate the percent error. Does this make sense to you? I’m not sure if I understand your question properly. Hi Lukasz, thanks for the kind response. I understand the concept of extrapolation to obtain the “near correct answer”. My misunderstanding is how to obtain the “correct answer” for a given mesh size. I would appreciate your explanation, please. Thank you! I’m not sure if I understand what do you mean by “correct answer for a given mesh”. If you have a mesh it will produce an answer… there is kind of “one” answer for a given mesh… so not much to choose from. It’s the most and the least correct answer at the same time (since it is only one). I feel that there is something deeper in your question, but I can’t grasp it I think. Do you mean stuff like stress averaging or something? I’ve read through your guide again, carefully and I understand mesh convergence study better now. Hi, this is kamal. I have a doubt that whether we can edit the mesh size in 3d means can we give the length width and depth. If we know the proper size of mesh can we do the exact meshing? I’m not sure if I understand your question… If you have a 3D part and you want to do a mesh refinement you should change all 3 dimensions so that cubic elements are… still cubic. You may be interested in learning about the aspect ratio. There are of course ways to change all dimensions of FEA elements, but those differ from software to software. but i got one doubt, once the mesh is converged, how to determine from which element size onwards the mess started converging. Is there rule that the number of nodes(present element size) should be more than double than the number of nodes of previous element size. I am doing a balloon expanded stent for my bachalor thesis at NUS. I am doing my mesh convergence now. However the problem I am facing is that when I reduce my element size, my solutions stop converging and the job fails. So how can I solve this problem? Just to be certain – this is the same task, all BC is identical etc? Maybe with remeshing something went bad with node numbering and you should re-assigned supports? Some systems have such issues. Have you tried bigger mesh, or is solution converging only in one single instance? It’s hard to help, as I’m not sure what are you doing and what type of analysis are you trying to perform – a description would help!